All these horses dying for what is basically entertainment. Utterly unconscionable. horse racing is stupid. 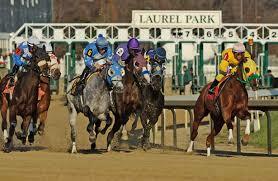 You have human beings[jockeys] pushing horses to run at such high speeds that breakdowns are inevitable. The horses I saw at the racetrack were having problems with swelling in the ankles and knees. These surfaces are too hard. I feel sorry for the jockeys who got killed, but they know what the deal is. I thank you Patrick for helping me to realize just how often catastrophic breakdowns. I hope your message gets to the masses of people. who support horse racing.